Have You Already Lost Your Right to Vote? Call it Democracy! Although this isn’t a “self-help” matter per se, it does address human rights and we are big advocates for human rights. The film provides a controversial, yet non partisan overview of the history of the Electoral College and explores how issues of race and socioeconomic divides impact your right to vote. Do you have a right to vote? Are you being disenfranchised by obstacles such as impossible voter wait times and biased voting stations? Here is a link to the film’s website. 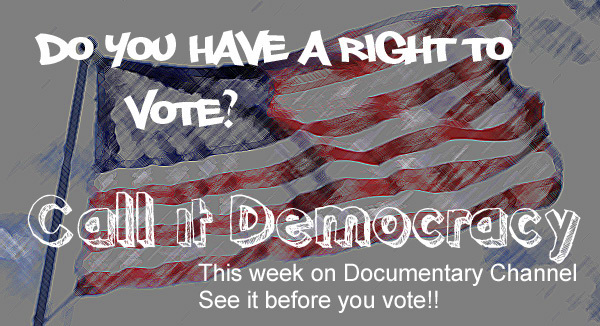 Watch the film at The Documentary Channel before you vote! Tags: democracy, electoral college, presidential election, voter rights. Bookmark the permalink.